Just wanted to say hi before all the craziness starts! The smells, the tastes, the excitement are so great. I love this holiday but I must admit that the days of cooking that precede it are always long with lots of time spent on my feet! But it's worth it! This year one of my Thanksgiving classes involved a Spatchcocked Turkey and that's what I'm cooking on the Day as well. This involves cutting out the turkey's backbone and flattening it for quick moist roasting. 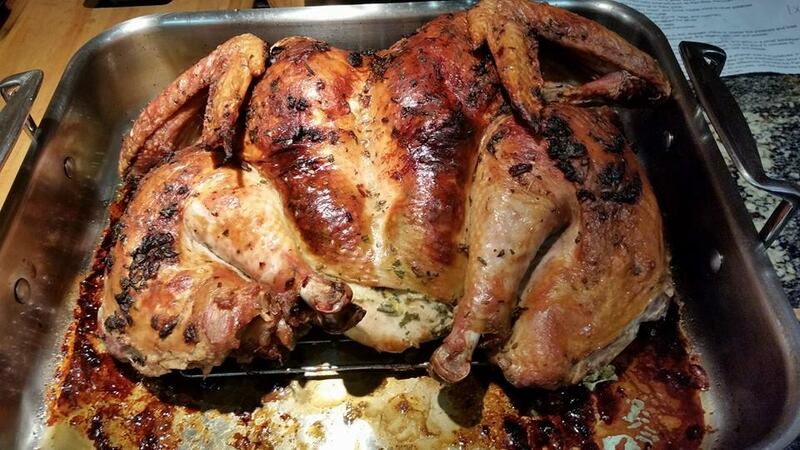 While relatively easy to do on a chicken or game hens it is a bit gruesome with a turkey. My kitchen shears and chef's knife usually devolve into the use of my cleaver and a bit of hacking if truth be told but the resulting succulent turkey with a cooking time of about 1 1/2 hours makes it all worth while. My last newsletter included a few basic sides dishes from this years collection so if you didn't have a chance to check these out, here's the link to these recipes. The Make-Ahead Mashed Potatoes are made the day before and popped into the oven 40 minutes before dinner time, right next to the Bacon and Leek Dressing. Then there's a side of Cranberry-Orange Sauce, Maple Sweet Potato Mash and Roasted Brussels Sprouts with Bacon--oh my! 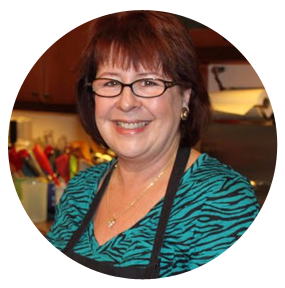 If you have looked through my site yet you may have noticed that I now have a tab for Recipe Collections. My first one--Holiday Appetizers 2015--is available now. I have included 20 of my all time favorites--click the tab for a list of these recipes. The collection is only $4.99! After you pay online I will receive notice and email you the booklet. Don't panic, it's not set up as an automatic download as of yet. I'm quick to get these to you but do give me 24 hours in case I'm off shopping, teaching or just enjoying life! Welcome to my new website--Phillis Carey--The Casual Gourmet. I've had a wonderful web designer creating this for 3 months now and it's now ready for you to view. I am still working on a few things and will eventually change it's location to philliscarey.com but for now you can find me here when you want to see what classes I'm currently offering and/or send me an email to register for classes or ask a question. Or just check in to see what I'm up to. Links to my Facebook page and Instagram are also all right here as well. Under the Classes heading, choose a particular location to take you there or just click and scroll through all my current classes. If you find one you want to register for, click and send me an email. I'll get right back to you with your confirmation. Everything is all right here now. 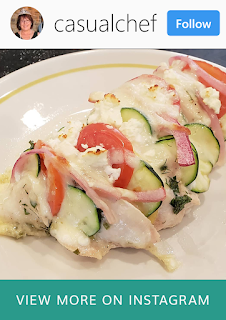 I'll still continue with my "Recipe of the Week Newsletters" so keep watching for those each week (or if you are not receiving these, click Join my Mailing List). Most of the weekly recipes from these newsletter will now be found on this site so can easily look them up without having to search through your old emails. Again, everything will be right here! The Diva/Queen Event is quickly approaching--December 6 is just around the corner! 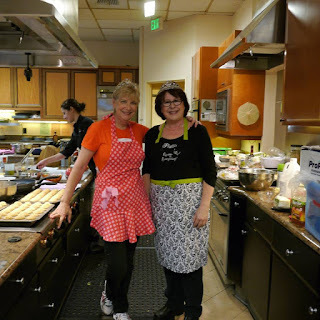 Diane Phillips and I are gearing up with shopping lists and meetings to create a truly special event for you all who have signed up. We promise to post lots of pictures and some live on Facebook and Instagram that day during the event for those who could not attend. We're really looking forward to seeing so many of you who we haven't seen since the closing of Great News. 2-8 oz. pkg. cream cheese, at room temp. 1. For crust, combine flour, sugar and salt in food processor. Add butter and pulse to cut into small pieces. Whisk 2 T. ice water with egg yolk and add to processor. Process until moist crumbs form, adding more water by teaspoonfuls if dough is dry. Press dough over bottom and up sides of a 10 to 11-inch diameter tart pan with removable bottom, making sure that the edges are twice as thick as the bottom. Freeze crust for 30 minutes. Preheat oven to 375 degrees. Bake crust until golden brown, about 30 minutes. Transfer to a rack and spread with 1/4 cup jam and cool. Reduce oven temperature to 350 degrees. 2. For filling, beat cream cheese and sugar until smooth and fluffy. Beat in egg, then vanilla. Add sour cream and beat just to blend. Pour filling into tart crust and bake until filing is set but center moves slightly when pan is gently shaken, 20 minutes. Cool on a rack and then refrigerate until cold, at least 4 hours and up to 24 hours. 3. Melt 1/4 cup jam and toss with raspberries or blueberries. Spoon fruit over top of tart and chill until set. Remove from pan and cut into wedges to serve. 1. Place broth in a saucepan and bring to a simmer; keep at a simmer while cooking the risotto. 2. For risotto, heat olive oil in a Dutch oven over medium high heat. Add the onion and sauté until tender, about 4 minutes. Add rice; stir 1 minute. 3. Add 1 cup hot broth and lower heat just to keep mixture simmering. Stir often and add broth 1 cup at a time as needed. Keep stirring often and add lemon juice, zest and pepper along with the fourth cup of broth. Keep stirring and cooking until rice is just barely tender. 4. Stir in the shrimp and cook 1 minute. Stir in the asparagus and continue cooking and stirring until rice is tender and shrimp is cooked through, about 2 minutes adding more broth if necessary to maintain a creamy texture. 5. Remove rice from heat and stir in butter and cheese. Season to taste with salt and pepper. Divide rice between bowls or plates and sprinkle with parsley; serve immediately. 1. Preheat oven to 350 degrees. Arrange half the tortillas in the bottom of a greased 9 x 13 inch casserole. In a large bowl combine the chicken, black beans and salsa. Layer half on top of the tortillas. Drop 1/2 cup Crema on top and then sprinkle with half the chilies, half the olives and half the cheeses. Repeat to make a second layer. 2. Cover casserole with foil and bake for 25 minutes. Uncover and bake for 10 minutes longer or until bubbly and cheese is melted on top. Serve, drizzled with remaining 1/2 cup Crema and sprinkled with cilantro. Make ahead: Cover casserole and refrigerate up to 24 hours. Bake covered casserole for 40 minutes before uncovering and baking another 10 to 15 minutes. 2. For salmon, preheat oven to 375 degrees. Season fish well with salt and pepper. Heat 2 tablespoons oil in a large nonstick pan. Sear fish 1 minute per side and then transfer to a parchment-lined baking sheet. 3. Toss remaining 1 tablespoon oil with parsley, chives and pistachio nuts. Brush fish lightly with the Apricot Glaze. Spread pistachio mixture on the fish and bake for 6 to 8 minutes or until just cooked through. Serve salmon in a pool of the Apricot Glaze or place glaze in a squeeze bottle and drizzle over the top. 1. For the gravy, cook the bacon in a large skillet over medium heat until crispy and most of the fat has been rendered, 10 to 12 minutes. Transfer bacon to a paper-towel-lined plate; set aside. Add the onions to the pan and cook until softened, 4 to 6 minutes, and then stir in the mushrooms and thyme and cook until the mushrooms are just cooked through, 4 to 6 minutes longer. Stir in the flour to combine and cook for 2 minutes. Add the stock and bring to a boil over medium-high heat, and then reduce to a simmer and cook, stirring frequently, until the sauce is thickened to the consistency of gravy, 6 to 8 minutes. Cover and set aside. 2. For the chicken, trim and pound to an even 1/4 inch thickness between 2 sheets of plastic wrap. If the chicken breasts are large, first cut in half crosswise and then pound. Lightly season with salt and pepper. 3. Coat chicken first in flour, then in eggs mixed with mustard and finally in the breadcrumbs to coat well. Transfer breaded chicken to a baking sheet lined with a cooling rack and refrigerate for 15 minutes. 4. Preheat the oven to 250 degrees. Heat 3 tablespoons of the oil over medium-high heat in a large nonstick skillet. Melt 6 tablespoons of the butter into the oil until it starts to bubble, and then add half of the breaded cutlets and cook until golden brown on both sides and cooked through, flipping once, 4 to 5 minutes per side. 5. Transfer chicken to a baking sheet lined with a cooling rack and keep warm in the oven. Cook the remaining cutlets, making sure to wipe out the pan and use new oil and butter each time. Keep adding the finished cutlets to the baking sheet in the oven as you cook them. To serve, top the Schnitzel with the Bacon and Mushroom Sauce and sprinkle with parsley. The New York Times didn't much care for Burnt, but I thoroughly enjoyed watching all the antics and the beautiful plates of food. 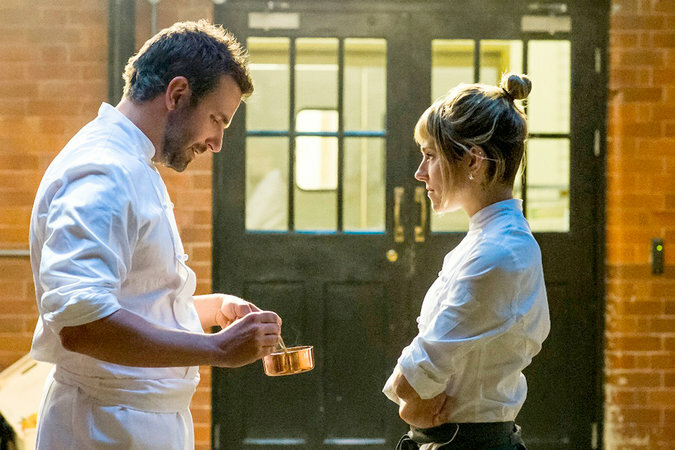 Not a fun road/food movie like Chef from last year, but a decent movie with a plot focused on a man putting his demons behind him while making some really great food in a kitchen most restaurants would kill for! Have you watched it? Share your thoughts in the comments below!